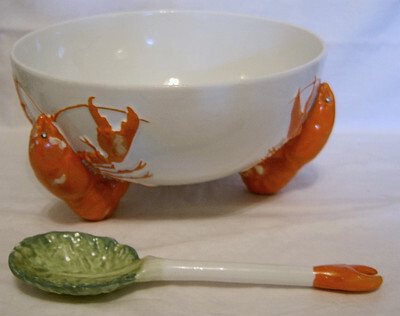 This is one of the earliest 'Lobster' series of tableware produced by W & R Carlton Ware before the series was changed to Langouste when, at the same time, two new colours - cream and chartreuse (a variation of pale green) were introduced. However, this is the original production and, as such, the condition is very good. The bowl itself is in excellent condition with no chips/nibbles/etc. However, there is some light crazing and paint flaking to the lobster adornments which has happened over its time in a home. 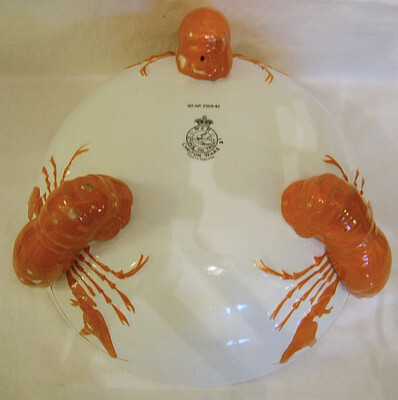 Colourwise, the bowl is a good clean white/cream with the lobsters being the traditional orange/red. The single complementary server is in excellent condition. It measures approx 8.25 inches (21 cms) in diameter with a height of 4.5 inches (11.5 cms). It is backstamped appropriately as can be seen from the photo.